Seattle, WA : YWAM, 2001. Poor Canadian farm boy Jonathan Goforth braved disaster, danger, disease, and even the Boxer Rebellion to share God&apos;s love with hundreds of thousands of people in China. 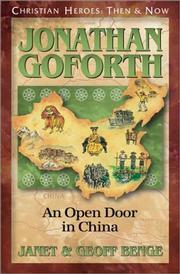 Jonathan Goforth: An Open Door in China / Geoff Benge and Janet Benge. 100 Personl Name ME $a Personal name Benge, Janet & Geoff. $c Statement of responsibility Geoff Benge and Janet Benge. 520 Summary Etc. $a Summary, etc. note Poor Canadian farm boy Jonathan Goforth braved disaster, danger, disease, and even the Boxer Rebellion to share God&apos;s love with hundreds of thousands of people in China. 650 Subj:Topic 4 $a Source other than LC MISSIONARIES--BIOGRAPHY.